grandma's cookie jar: Winter Fun - Icy Sun Catchers! As I wrote yesterday, winter has arrived in West Michigan! It is cold and snowy and cold! So, as I browsed Pinterest this morning I noticed the perfect activity for my grandsons the next time they are at my house . . . we will make Icy Sun Catchers! 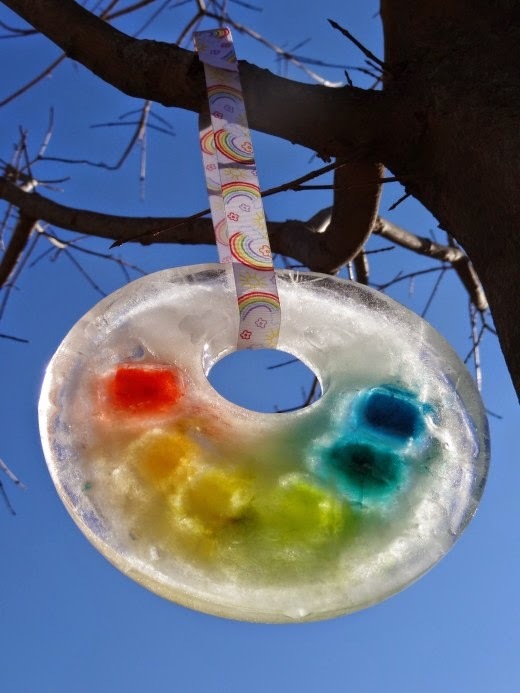 What is an, "Icy Sun Catcher", you ask? Well, it is a sun catcher you make from ice! Follow this link for simple directions then gather your grandchildren, pans, cups, water and food coloring and get ready to make some really "cool" sun catchers! They would be great fun to make and hang in your yard and give some to your neighbors as well! Just imagine how beautiful your neighborhood could be . . . at least until it gets warm! I wonder if we could make them outside instead of using the freezer??? Sounds like a fun project to try when the boys come over for a sleepover this week! I really love the bottom one with the marbles only I would make it packed with marbles.